Our coffee beans are certified by the Rainforest Alliance. We, at Rent Mother Nature, are proud to be working with a family-owned farm in the high mountains of Jinotega, Nicaragua that produces some of the finest coffee beans grown using the most sustainable methods. When one first sees a coffee tree, it is hard to understand how those bright red beans (called cherries) can morph into the brown beans that produce dark, rich coffee. It does happen: The magic takes place on this family-owned farm in the high mountains of Jinotega, Nicaragua where the trees have glossy green leafs and –at the beginning of the harvest- bear beautiful white flowers. The beans are certified by the Rainforest Alliance to be grown using sustainable agriculture & socially responsible methods. They are shade-grown, high quality Arabica variety, grown only at elevations of 2000 to 6500 feet. The farm grows coffee in the most fertile region of northern Nicaragua, known as the Coffee Triangle, at an altitude of 4000 feet above sea level. 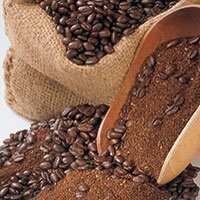 Arabica coffee has a worryingly low genetic diversity. This means it is more susceptible to disease and climate change – and could even theoretically become extinct in the future. Creating and/or finding more genetic variety is of key importance right now. The coffee crop is so important to the Nicaraguan economy that brigades of students and municipal workers join the farmers each year to bring in the harvest. A typical day begins at 3:00 a.m. for the women who bake tortillas and cook rice and beans. The coffee workers (men, women, and children) start work at 6:00 a.m. and continue until the late afternoon. Since the Nicaraguan revolution of 1979, workers have won wage increases and hour guidelines, bonuses, and vacations, in addition to access to schooling and health care. However, at harvest time, picking can often go on through the weekend. 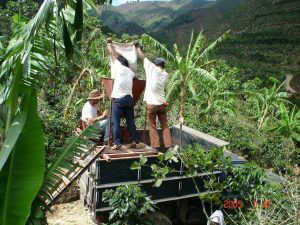 The coffee harvest will probably always be labor-intensive since machines cannot navigate the steep terrain where the trees grow, and machines cannot separate the ripe red from the green cherries. Picking must be done painstakingly. Each cherry’s tiny stem has to remain on the tree so that a cherry will grow the following season. While a hard-working international volunteer may pick 20 to 60 pounds in a day, an experienced coffee farmer will harvest 150 pounds, yielding enough for about 2500 cups of coffee! Each day at sunset, the full bags are hauled to the “beneficio humedo” or wet processing center, usually on the farm. Here a noisy “pulpador” machine removes the cherry pulp to reveal two slippery yellowish beans. They are chewy without flavor. The beans are then fermented overnight in water to bring out the coffee flavor. The next day, they are dried in the sun. On the third day, they are carefully sorted by hand. Called “pergamino” at this stage of the harvest, the beans are packed in burlap bags and delivered to the government agency responsible for the entire coffee-export process. There, they go through the “beneficios secos”–drying. They are either dried by the sun or by oil-heated furnaces, and their two hulls are removed by machine. They are now ready for the final grading into numerous export categories. Export-quality beans are called “oro” -Spanish for gold. In the English-speaking coffee industry, they are referred to as green beans. Confusing, isn’t it? The sustainable circle of life at the farm is completed by its profits being generously shared with its workers (5% of all profits are used to help the farm’s workers and families by investing in schools & health centers). It is a community which is proud of the superb coffee harvest that their strict eco-friendly practices produce, literally from seed to cup. Once roasted, the coffee is in a form we can all recognize–even with our eyes closed. That delicious aroma is the clue–from bright red, pulpy cherries to rich brown coffee beans just begging to be brewed!